The manuscript in either Chinese or English ( preferably both ) should be electronic-typed as. 34 words a line, 31 lines a page, horizontal text ow with pagination. The body including all tables and graphs, notes, and appendixes. It should be between 10 and 16 pages, except Chinese/English abstract or bibliography. (1) Cover page： basic information of the contributor is required. (2) Chinese / English abstract: Chinese and English abstracts of no more than 500 words respectively and no more than 5 key words, followed by the body of the manuscript ( including tables, notes and appendixes ) and bibliography. Identi cation of the contributor should not appear elsewhere except for the cover page. (4) Tables and gures should be numbered with captions above the tables and below the gures. Original spelling for proper nouns should be retained in parentheses. (1) All papers deemed appropriate for the Journal are sent to anonymously to readers and rated as (a) accepted for publication, (b) accepted for publication after revision by the author, or (c) not accepted. (2) Upon publication, the Research Development and Evaluation Commission, Executive Yuan, and the National Taiwan Arts Education Institute will hold the right of electronic publication. (4) Volume 9 Issue 1 of the Journal 2011 will come out in 5th July. (5) Volume 9 Issue 2 of the Journal 2011 will come out in 5th December. (3) Upon publication, three complimentary copies of the Journal will be sent to the contributors. 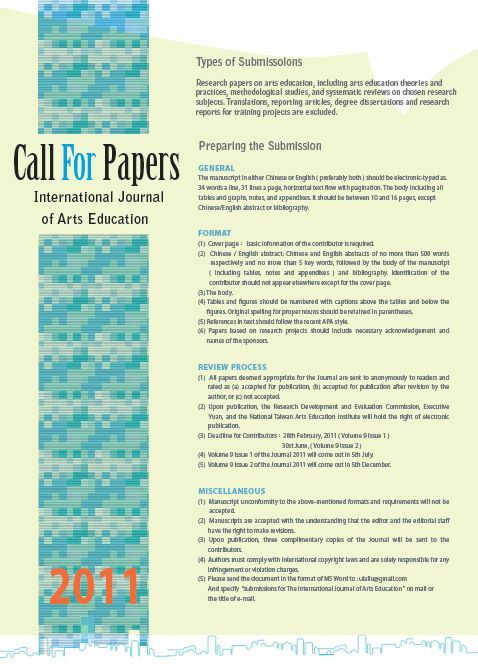 And specify “submissions for The International Journal of Arts Education ” on mail or the title of e-mail.